This article is about the concept in Hinduism. For the 2009 film, see Avatar (2009 film). For the computing use, see Avatar (computing). For other uses, see Avatar (disambiguation). An avatar (Sanskrit: अवतार, IAST: avatāra) is a concept in Hinduism and it means "descent", and refers to the appearance or incarnation of a deity on earth. The term also generally refers to "alight, to make one's appearance" and sometimes used to refer to any revered guru or human being. 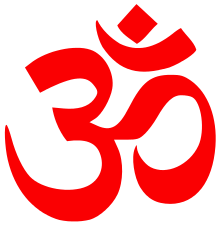 The word avatar does not appear in the Vedic literature, but appears in verb forms in post-Vedic literature, and as a noun particularly in the Puranic literature after the 6th century CE. The Rigveda describes Indra as endowed with a mysterious power of assuming any form at will. The Bhagavad Gita expounds the doctrine of Avatara but with terms other than avatar. Incarnation concepts similar to avatar are also found in Buddhism, Christianity and others. The scriptures of Sikhism include the names of numerous Hindu gods and goddesses, but it rejected the doctrine of savior incarnation and endorsed the view of Hindu Bhakti movement saints such as Namdev that formless eternal god is within the human heart and man is his own savior. The Sanskrit noun (avatāra /ˈævəˌtɑːr, ˌævəˈtɑːr/; Hindustani: [əʋˈt̪aːr]) is derived from the Sanskrit roots ava (down) and tṛī (to cross over). These roots trace back, states Monier-Williams, to -taritum, -tarati, -rītum. Neither the Vedas nor the Principal Upanishads ever mention the word avatar as a noun. 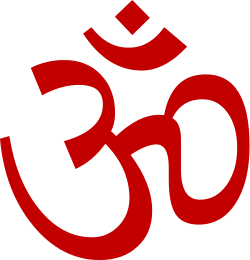 The verb roots and form, such as avatarana, do appear in ancient post-Vedic Hindu texts, but as "action of descending", but not as an incarnated person (avatara). The related verb avatarana is, states Paul Hacker, used with double meaning, one as action of the divine descending, another as "laying down the burden of man" suffering from the forces of evil. The manifest embodiment is sometimes referred to as an incarnation. The translation of avatar as "incarnation" has been questioned by Christian theologists, who state that an incarnation is in flesh and imperfect, while avatar is mythical and perfect. The theological concept of Christ as an incarnation, as found in Christology, presents the Christian concept of incarnation. According to Oduyoye and Vroom, this is different from the Hindu concept of avatar because avatars in Hinduism are unreal and is similar to Docetism. Sheth disagrees and states that this claim is an incorrect understanding of the Hindu concept of avatar. [note 1] Avatars are true embodiments of spiritual perfection, one driven by noble goals, in Hindu traditions such as Vaishnavism. The Vishnu avatars appear in Hindu mythology whenever the cosmos is in crisis, typically because the evil has grown stronger and has thrown the cosmos out of its balance. The avatar then appears in a material form, to destroy evil and its sources, and restore the cosmic balance between the everpresent forces of good and evil. The Bhagavata Purana describes Vishnu's avatars as innumerable, though ten of his incarnations (Dashavatara), are celebrated therein as his major appearances. The ten major Vishnu avatars are mentioned in the Agni Purana, the Garuda Purana and the Bhagavata Purana;[note 2] thirty-nine avatars are mentioned in the Pañcaratra. The commonly accepted number of ten avatars for Vishnu was fixed well before the 10th century CE. The ten best known avatars of Vishnu are collectively known as the Dasavatara (a Sanskrit compound meaning "ten avatars"). Five different lists are included in the Bhagavata Purana, where the difference is in the sequence of the names. Freda Matchett states that this re-sequencing by the composers may be intentional, so as to avoid implying priority or placing something definitive and limitation to the abstract. The avatar concept was further developed and refined in later Hindu texts. One approach was to identify full avatar and partial avatars; Krishna, Rama and Narasimha were full avatars (purna avatars), while others were partial avatars (ansha avatars). Some declared, states Noel Sheth, that every living creature is an avatar of Vishnu. 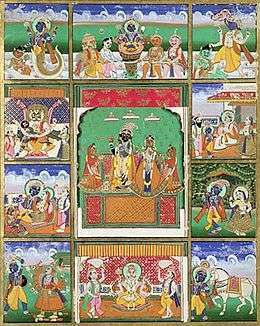 The Pancharatra text of Vaishnavism declares that Vishnu's avatar include those that are direct and complete (sakshad), indirect and endowed (avesha), cosmic and salvific (vyuha), inner and inspirational (antaryamin), consecrated and in the form of image (archa). Yet another classification, developed in Krishna schools, centers around Guna-avatars, Purusha-avatars and Lila-avatars, with their subtypes. The Guna-avatar classification of avatars is based on the Guṇas concept of the Samkhya school of Hindu philosophy, that is Rajas (Brahma), Sattva (Vishnu), and Tamas (Shiva). These personalities of the Trimurti is referred to as Guna avatars. The Purushavatara are three. The first evolves the matter (Prakriti), the second is the soul present in each individual creature, the third is the interconnected oneness or Brahman that connects all souls. 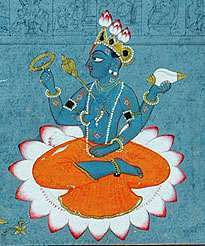 The Lilavataras are partial or full manifestations of Vishnu, where either some powers (Shakti) or material parts of him exist. Vishnu is Purushavatara. The Matsya, Kurma and Vamana avatars of Vishnu are Lilavataras. A Purnarupa in this classification, is when Vishnu manifests completely along with his qualities and powers. 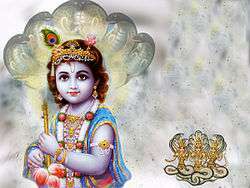 In Bengal Vaishnavism, Krishna is the Purnarupa. In Shaivism, Bhairava is the purnarupa of Shiva. The Guru Granth Sahib reverentially includes the names of numerous Hindu deities, including Vishnu avatars such Krishna, Hari and Rama, as well those of Devi as Durga. Dasam Granth has three major compositions, one each dedicated to avatars of Vishnu (Chaubis avatar), Rudra and Brahma. However, Sikhism rejects the doctrine of savior incarnation, and only accepts the abstract nirguna formless god. The Sikh Gurus endorsed the view of Hindu Bhakti movement saints such as Namdev (~1270 – 1350 CE) that formless eternal god is within human heart and man is his own savior. The Linga Purana lists twenty-eight avatars of Shiva. 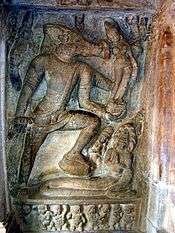 In the Shiva Purana there is a distinctly Saivite version of a traditional avatar myth: Shiva brings forth Virabhadra, one of his terrifying forms, in order to calm Narasimha, an avatar of Vishnu. 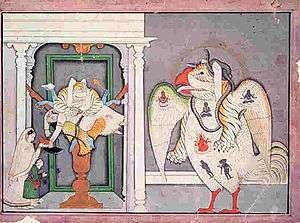 When that fails, Shiva manifests as the human-lion-bird Sharabha which calms down lion-bird Narasimha avatar of Vishnu, and Shiva then gives Vishnu a chakra as gift. A similar story is told in the late medieval era Sharabha Upanishad. 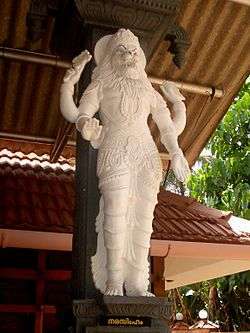 However, Vaishnava Dvaita school refutes this Shaivite view of Narasimha. Avatars of Devi. Clockwise from upper left: Durga, Kali, Parvati, Sita. Avatars are also observed in Shaktism, the sect dedicated to the worship of the Goddess (Devi), but they do not have universal acceptance in the sect. The Devi Bhagavata Purana describes the descent of Devi avatars to punish the wicked and defend the righteous—much as the Bhagavata Purana does with the avatars of Vishnu. Like Vishnu, his consort Lakshmi incarnates as Sita and Radha – the consorts of Rama and Krishna avatars. 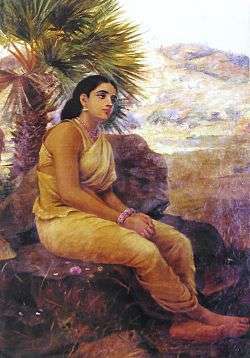 Nilakantha, an 18th-century commentator on the Devi Bhagavata Purana – which includes the Devi Gita – says that various avatars of the Goddess includes Shakambhari and even the masculine Krishna and Rama – generally thought to be Vishnu's avatars. Lakshmi and Saraswati are also goddesses worshipped as Devi avatars. Sridevi and Bhudevi are two different forms of Goddess Lakshmi. Dharini, the consort of Parashurama, Sita, the consort of Rama and Yashodhara, the consort of Buddha along with the consorts of the previous incarnations of Vishnu are all considered full incarnations of Lakshmi. On the other hand, Radha and the gopis, Rukmini, Satyabhama and the rest of Krishna's wives with the exception of Yamuna are all considered partial incarnations of Lakshmi. ↑ Buddha, a real person, is included as an avatar of Vishnu in many Hindu texts. ↑ Mohini, the female avatar of Vishnu, appears in stories about the Kurma avatar. ↑ Some versions include Balarama (the elder brother of Krishna) as the eighth avatar, with Krishna listed as the ninth instead of Buddha, while others replace Buddha with Balarama as the ninth avatar.Jayadeva in his Git Govinda instead adds both Balarama and Buddha,but omits Krishna as he is taken as the equivalent of Vishnu,the origin of all avatars. ↑ Some medieval Indian texts spell it as Kalkin. 1 2 3 4 5 6 Monier Monier-Williams (1923). A Sanskrit-English Dictionary. Oxford University Press. p. 90. 1 2 3 Sheth 2002, pp. 98-99. 1 2 3 4 Daniel E Bassuk (1987). Incarnation in Hinduism and Christianity: The Myth of the God-Man. Palgrave Macmillan. pp. 2–4. ISBN 978-1-349-08642-9. 1 2 Paul Hacker 1978, pp. 424, also 405–409, 414–417. ↑ Sheth 2002, pp. 98–99. 1 2 Kinsley, David (2005). Lindsay Jones, ed. Gale's Encyclopedia of Religion. 2 (Second ed.). Thomson Gale. pp. 707–708. ISBN 0-02-865735-7. 1 2 Bryant, Edwin Francis (2007). Krishna: A Sourcebook. Oxford University Press US. p. 18. ISBN 978-0-19-514891-6. ↑ Sheth 2002, pp. 98–125. ↑ Hawley, John Stratton; Vasudha Narayanan (2006). The life of Hinduism. University of California Press. p. 174. ISBN 978-0-520-24914-1. ↑ David R. Kinsley (1998). Tantric Visions of the Divine Feminine: The Ten Mahāvidyās. Motilal Banarsidass. pp. 115–119. ISBN 978-81-208-1522-3. 1 2 Lai Ah Eng (2008). Religious Diversity in Singapore. Institute of Southeast Asian Studies, Singapore. p. 221. ISBN 978-981-230-754-5. 1 2 Constance Jones; James D. Ryan (2006). Encyclopedia of Hinduism. Infobase. p. 474. ISBN 978-0-8160-7564-5. 1 2 3 Sheth 2002, pp. 115-116 with note 2. 1 2 3 Eleanor Nesbitt (2005). Sikhism: A Very Short Introduction. Oxford University Press. pp. 16, 24–25. ISBN 978-0-19-157806-9. ↑ "avatar". Random House Webster's Unabridged Dictionary. 1 2 3 Sheth 2002, p. 98. ↑ Justin Edwards Abbott (1980). 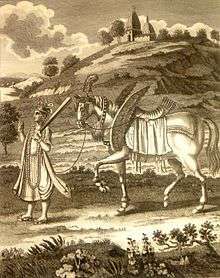 Life of Tukaram: Translation from Mahipati's Bhaktalilamrita. Motilal Banarsidass. pp. 335–336. ISBN 978-81-208-0170-7. 1 2 Paul Hacker 1978, pp. 415-417. ↑ Paul Hacker 1978, pp. 405-409. ↑ Paul Hacker 1978, pp. 424, also 405-409, 414-417. ↑ Sebastian C. H. Kim (2008). Christian Theology in Asia. Cambridge University Press. pp. 169–176. ISBN 978-1-139-47206-7. ↑ Sheth 2002, pp. 107-109. 1 2 3 4 Matchett, Freda (2001). Krishna, Lord or Avatara? : the relationship between Krishna and Vishnu. 9780700712816. p. 4. ISBN 978-0-7007-1281-6. ↑ Mercy Amba Oduyoye, H. M. Vroom, One gospel – many cultures: case studies and reflections on cross-cultural theology, Rodopi, 2003, ISBN 978-90-420-0897-7, p. 111. 1 2 Sheth 2002, p. 108. 1 2 3 4 Sheth 2002, p. 99. 1 2 James Lochtefeld 2002, p. 228. ↑ King, Anna S. (2005). The intimate other: love divine in Indic religions. Orient Blackswan. pp. 32–33. ISBN 978-81-250-2801-7. 1 2 Mishra, Vibhuti Bhushan (1973). Religious beliefs and practices of North India during the early mediaeval period, Volume 1. BRILL. pp. 4–5. ISBN 978-90-04-03610-9. ↑ Rukmani, T. S. (1970). A critical study of the Bhagavata Purana, with special reference to bhakti. Chowkhamba Sanskrit studies. 77. Varanasi: Chowkhamba Sanskrit Series. p. 4. ↑ Schrader, Friedrich Otto (1916). Introduction to the Pāñcarātra and the Ahirbudhnya saṃhitā. Adyar Library. p. 42. ↑ Matchett 2001, p. 160. ↑ James Lochtefeld 2002, pp. 228-229. 1 2 James Lochtefeld 2002, pp. 705-705. ↑ James Lochtefeld 2002, p. 119. ↑ James Lochtefeld 2002, pp. 421-422. 1 2 James Lochtefeld 2002, p. 737. ↑ James Lochtefeld 2002, pp. 500-501. ↑ James Lochtefeld 2002, pp. 550-552. ↑ James Lochtefeld 2002, pp. 370-372. ↑ Daniel E Bassuk (1987). Incarnation in Hinduism and Christianity: The Myth of the God-Man. Palgrave Macmillan. p. 40. ISBN 978-1-349-08642-9. ↑ Sheth 2002, p. 117 with notes 12 and 13. ↑ James Lochtefeld 2002, p. 128. ↑ Gopal, Madan (1990). K.S. Gautam, ed. India through the ages. Publication Division, Ministry of Information and Broadcasting, Government of India. p. 74. 1 2 3 4 5 6 Sheth 2002, p. 100. 1 2 3 4 Barbara A. Holdrege (2015). Bhakti and Embodiment: Fashioning Divine Bodies and Devotional Bodies in Krsna Bhakti. Routledge. pp. 50–67. ISBN 978-1-317-66910-4. ↑ Janmajit Roy (2002). Theory of Avatāra and Divinity of Chaitanya. Atlantic Publishers. pp. 190–191. ISBN 978-81-269-0169-2. 1 2 Daniel E Bassuk (1987). Incarnation in Hinduism and Christianity: The Myth of the God-Man. Palgrave Macmillan. pp. 143–144. ISBN 978-1-349-08642-9. ↑ Mittal, Sushil (2004). The Hindu World. New York: Routledge. p. 164. ISBN 0-203-67414-6. ↑ David Smith (2003). The Dance of Siva: Religion, Art and Poetry in South India. Cambridge University Press. p. 186. ISBN 978-0-521-52865-8. ↑ Pashaura Singh; Norman Gerald Barrier; W. H. McLeod (2004). Sikhism and History. Oxford University Press. pp. 136–147. ISBN 978-0-19-566708-0. ↑ William Owen Cole (2004). Understanding Sikhism. Dunedin Academic. pp. 47–49. ISBN 978-1-903765-15-9. ↑ Pashaura Singh (2011). Mark Juergensmeyer and Wade Clark Roof, ed. Encyclopedia of Global Religion. SAGE Publications. p. 138. ISBN 978-1-4522-6656-5. ↑ Grimes, John A. (1995). Gaṇapati: song of the self. SUNY Press. p. 105. ISBN 978-0-7914-2439-1. ↑ Parrinder, Edward Geoffrey (1982). Avatar and incarnation. Oxford: Oxford University Press. pp. 87–88. ISBN 0-19-520361-5. 1 2 Mariasusai Dhavamony (2002). Hindu-Christian Dialogue: Theological Soundings and Perspectives. Rodopi. p. 63. ISBN 90-420-1510-1. ↑ Winternitz, Moriz; V. Srinivasa Sarma (1981). A History of Indian Literature, Volume 1. Motilal Banarsidass. pp. 543–544. ISBN 978-81-208-0264-3. ↑ Sharma, B. N. Krishnamurti (2000). A history of the Dvaita school of Vedānta and its literature: from the earliest beginnings to our own times. Motilal Banarsidass Publ. p. 412. ISBN 978-81-208-1575-9. ↑ Lutgendorf, Philip (2007). Hanuman's tale: the messages of a divine monkey. Oxford University Press US. p. 44. ISBN 978-0-19-530921-8. ↑ Catherine Ludvík (1994). Hanumān in the Rāmāyaṇa of Vālmīki and the Rāmacaritamānasa of Tulasī Dāsa. Motilal Banarsidass Publ. pp. 10–11. ISBN 978-81-208-1122-5. ↑ Sontheimer, Gunther-Dietz (1989). "Between Ghost and God: Folk Deity of the Deccan". In Hiltebeitel, Alf. Criminal Gods and Demon Devotees: Essays on the Guardians of Popular Hinduism. State University of New York Press. p. 332. ISBN 0-88706-981-9. ↑ Brown, Cheever Mackenzie (1990). The triumph of the goddess: the canonical models and theological visions of the Devī-Bhāgavata Purāṇa. SUNY Press. p. 32. ISBN 978-0-7914-0363-1. ↑ Hindu Avatāra and Christian Incarnation: A Comparison, Noel Sheth Philosophy East and West, Vol. 52, No. 1 (Jan., 2002), pp. 98, 117. James Lochtefeld (2002). 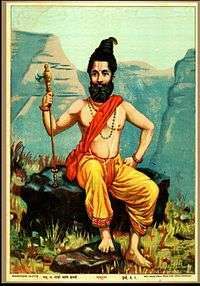 The Illustrated Encyclopedia of Hinduism, Vol. 1&2. Rosen Publishing. ISBN 0-8239-2287-1.